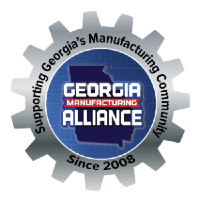 Georgia Manufacturing Alliance relocates to larger office space in Lawrenceville, Georgia to accommodate the organization's growth. Manufacturing is growing in Georgia, and so is the most active industry association supporting Georgia’s manufacturing community. With a very successful 2015 year, the Georgia Manufacturing Alliance is making big plans. As a result of hosting more than 1500 guests at their 73 events held around the state, GMA is enjoying significant growth in membership and regional chapters state-wide. “We are laying the ground-work now so that we can grow our administrative support of GMA. We needed additional office space now and room for future expansion. Having been in the same office space for over five years, moving has been a hard decision to make. But it is time. The Lawrenceville community has been very supportive of our efforts since the beginning, which is the primary reason that we chose to keep our headquarters in the city limits. Our team has been searching for a location for several months. And we are thankful to now announce that our new address is 175 Langley Drive Suite E-3 Lawrenceville, GA 30046. We are thrilled to be in the new space,” said Jason Moss, CEO of GMA.